On Friday 23rd March 2018, all roads led to DJ Tate’s Hush silent party. What more really could I add from the initial review I had given on Hush.. the Masquerade Ball Edition? If you had been to the hush fete before and had a great time. Hush: The Neon Lights Edition, brought to us by DJ Tate, came back bigger and better. First off the mark, was the venue change and it had moved on from an intimate location in the City to the O2 Academy in Islington. Perhaps indeed it was to accommodate the growing interest, but I had to give it to DJ Tate, as this had worked. The last venue was a decent size for the then crowd, however, this one was huge by comparison with a crowd of eager first-timers filling the venue. The doors opened at 11am and with it billed to finish at 5am, I knew that the empty floor I walked into at 12.30am would not stay empty for long and I was right, as by 1.30am it was bustling and by 2am it was jam! It was the Neon Lights edition, with a choice of 3 channels and 10 top DJs. Yep. It was set to be live, I could feel the vibe even as I stepped in. It was bright and most came ready to sport their neon colours. However, if you have never been to a Hush event before, you have to experience this new, silent party phenomenon. It is a strange sensation for many to walk into a nightclub, hearing no music and only the sounds of voices, DJs on the mic and people gyrating to something you cannot hear. Your mind takes a little while to reinterpret and adjust, but when the magic happens… only then do you start to ‘bubble’ and enjoy the experience of silent partying. Even the bouncers and the security staff donned headphones and partied on silently with the rest of us. A big up to venue security team. Excellent, friendly, efficient staff where you don’t feel harassed by the time you get into a club! You just have to experience this silent party! So how does it work? Well, everyone is given a set of headphones upon arrival, with some simple instructions of how to operate and quite simply off you went. You are entirely spoilt for choice with 3 channels to chose from on the night and volume controls, for the level of music you wanted. You could switch between the red, blue or green channels available and each had a selection of DJs representing the coloured channels. RnB, bashment, hip hop and a whole host of all other genres of music are played by the top DJs selecting to play the tunes. It is a simple case of each (or each group) to their own. 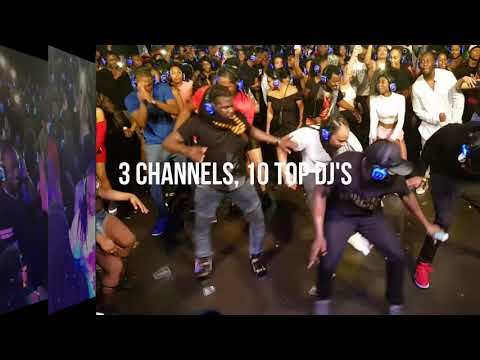 There were at times, of course, a channel ruled the dance floor and can honestly say that ‘Gas’ by Ding Dong, (featured video) tore up the dance floor – Supa Nytro and his blue team absolutely smashed it for that tune. The dance was lit! But all the DJ’s were on point, to be honest. I was on the red channel for the majority of the night as the quality of tunes that were spun, from DJs Armani HIC and Bliss, were on the fabulous level. I kid you not! However, as I watched the crowds, I switched to channels where I could see the vibe; and that was arguably one of the real benefits of the Hush silent party. Want to know more benefits? Well…..
You can visually gauge which DJ is delivering the most vibes from the visible majority channel colours on the headphones. You can order your drink, without screaming it to the barman. …they can hear you clearly. You can stop listening to music when you want and have a normal conversation. You can listen to a different DJ at the flick of a button. You have a choice of DJ’s to choose without leaving the room. You can turn down the music if you want to, without spoiling anyone else’s fun! Even if you can’t dance, no one will realise (especially if they are not on the same channel). I do have to stress that this is not a Soca vs Dancehall event and Hush is not a DJ competition. It is not a battle to see which DJs plays the best. It is literally about choices, without leaving your mates or switching rooms. A luxury of musical choice. “I can’t wait for the next one”! Suffice to say, for those that are now wondering…..don’t. Get to the next Hush.. and register your interest now, so you don’t miss the next event. Check out the videos. See for yourself! Previous Previous post: Yes! It’s time to reclaim our London Carnival. Next Next post: What’s new with the Real Soca Deal?